Reader Wendy shared news that London's Victoria and Albert Musuem is hosting an exhibition of pearls from now September 21 through mid-January 2014. The photos in The Guardian show remarkable examples, many with historic provenance. 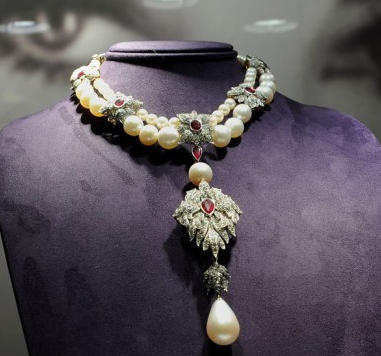 "Is it devaluation of the pearl or is it Mikimoto's dream come true?" asked Chadour-Sampson. "It is a matter of interpretation." However, the cultured pearl world contains many levels of quality. I sometimes am bemused, and other times irritated by the way jewelers or salespersons emphasize the "genuineness" and skip over quality. The Big Question is, What quality makes you happy? You will only know this from handling a representative pearl. 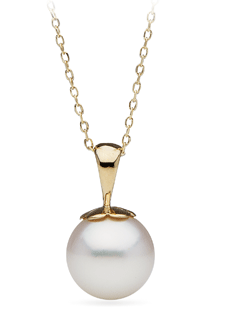 A simple suggestion: wade in by buying a pearl pendant, in the best quality you can afford. Whatever your personal style, aside from maybe your wash-the-dog sweatshirt, you will wear that piece with everything, layered or on its own. You can also use the pendant as a charm, attached to a bracelet or other piece. If the pendant makes you purr, your eventual strand, bracelet or pair of earrings will match that quality. One day, return to that vendor for more, or use your pendant as a comparator if shopping elsewhere. And you could stop right there. A single big South Sea has glowy charisma; a necklace of big headlight pearls might be too much for your lifestyle. At the prestige jeweler Gump's, a 9.5mm Tahitian, set in a hip silver bale, is only $150. (I had to check that price as Gump's pearls are usually on the high end.) A great way to see if Tahitians melt your heart, and I trust their pearl quality, but call first to ask if there is a selection of overtones. The bumply, sometimes rippled surface is characteristic; colours range from soft peach to deep rose and bronzy-green. I like the boule or lariat-style pendant, as in this design from Winterston UK, made here with a 9mm white Akoya. It's pricier than a drop on a chain, but you can slide the boule to adjust the length, and the 18k chain, unlike the other pendants in this post, is included in the price, £385. A Tahitian version (with green overtones) is £475. Pearls are no longer a luxury purchase, but even the choice of a simple pendant can overwhelm. I've had a few notes from women who either bought or were given pearls of a colour, size or variety that did not thrill. Sometimes I suggest restyling, but if you never suited the dark tones of Tahitians or find Akoyas just too white, you're better off gifting them to someone who makes them sing. Since your hair and makeup colours may have changed in the last decade, so too may your preferred gems and metals. Check reputable vendors like Pearl Paradise and Pearls of Joy to benchmark prices. With that info in hand, you won't make a rash decision–unless you wind up like Janet, who was supposed to be buying cat food and a pair of bedroom slippers when she met a friend for lunch one Saturday afternoon. Janet had one too many margaritas (which in her case was only one) and bought a gorgeous but pricey pearl pendant with a ruby and diamond clasp. Apparently when wading in, she hit a tsunami. Another reason why I like 30-day refund policies (offered by all vendors in this post)! But then I'm not Janet, who has happily kept the pendant and is wearing her old flip-flops for bedroom slippers. Ah, Duchesse. Janet violated the prime directive, "Never drink and shop," but luckily a happy ending. 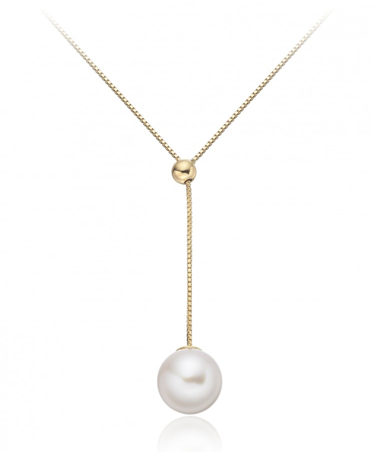 A pearl pendant is a lovely option. I am a bit intimidated by pearls albeit enthralled them as well. That was supposed to be "enthralled BY them as well." I hate when I do that. This is inspirational, truly! 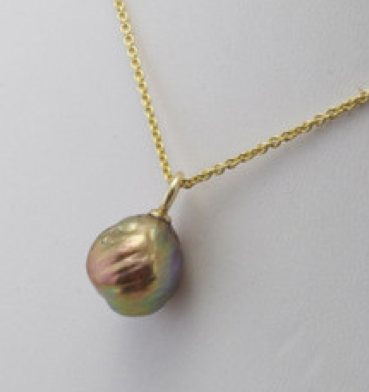 I now think I must have a pearl pendant and I'm going to start keeping an eye out for one that I love. Your examples are beautiful, and I can see that despite the apparent simplicity, the choice will actually be fairly complex. . . and fun! Those are beautiful. And I love the last one to death. I have a question for you. I went to Minneapolis - which is irrelevant - and did not bring a jewelry box - which is critical - and therefore wore my 3-strand 6.5-7mm pearl bracelet on my wrist with other bracelets and a watch and, it fell off. My father gave me the original strand in 1981, brought from a pearl merchant in the diamond district of New York as Mikimoto quality. It appears that it will cost me huge sums to replace. Ideas? My husband gave me a mabe pearl pendant on my wedding day. 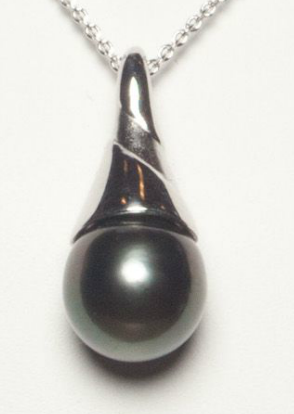 I bought my daughter a Tahitian pearl last year in Papeete. We should wear them more often. I will look for a new pearl this winter. Your examples are beautiful. I don't own a pearl pendant. I have several strands of pearls, all different qualities. The newest one, the gum ball pearls in various shades has a broken clasp, so I need to have it restrung and the clasp replaced so there will be no pendants for awhile! Retirement does not allow for liquid lunches and impulse shopping! I do hope Janet loves her necklace. Kristien: Ha! It's true: pick one or the other. materfamilias: I will enjoy seeing your eventual choice. 1. Check the Freshadama pearl bracelet at Pearl Paradise; these are truly *beautiful* pearls and far less than Mikimoto. PP can make you three 6mm strands if that's your wish. They also sell Hanadama quality which will be very close to your old ones, but more expensive. Again, call and talk to them, everything is possible. I can't tell you price but they will. You could order two bracelets to compare. Kojima's owner, Sara, is a wonderful person to ask for something that is in your mind but not on the site; she's a consummate pearl-hunter. And Kojima Company is not far from you- in Oakland. hostess: Thanks for reminding me- you can usually take a single pearl off a strand and have it made into a pendant. Most necklaces do not suffer from sneaking one pearl off a strand. I was going to post about this but you are the grand poo bah of such things! Such a good point about changing hair colour and make up, I am much more 'golden' than I used to be and I have noticed that yellow gold and rose gold now suit me more than platinum, that said i will never veer from white pearls, I adore them. Oh LPC, that's awful, I have learned the hard way that I need to have my jewellery reappraised every few years, it never crossed my mind and a few of my things are/were now worth 5 times the original valuations - had a weep, got over it. Bourbon: The need for regular reappraisal applies only if you have a policy which provides jewelry coverage, per item, at full replacement value. For that level of jewelry rider, the policy holder also needs to hire an appraiser approved by the insurer, as some policy holders shop for inflated appraisals. For years, I had that kind of policy. It was •very• expensive and since I had lost nothing major, I went to much lower coverage. So far, so good- but I have not endured a burglary like you have, and keep the irreplaceable pieces in a bank. Purty! I love the lariat-style one - just a touch more interest. I've got a smallish tahitian pendant and stud earrings which I wear when being conservative. I value the pendant highly as it was given by my mother, but I normally wear more showy costume jewellery.